Snow! | Can Bryan Write? Home » Sharing Gifts with Sarrah » Snow! Despite her lack of cold weather fur, Sarrah excitedly danced in our rare snow. Many years, we do not get any snow near sea level. Some winter’s we get a trace, others an inch or so as we did for Sarrah’s first, possibly instilling a lifelong zest for snow play. On extreme occasion we get Buried with several inches, those heavy snowfalls were delightful, for Sarrah. Her eyes got bigger; she made whimpers of excitement, when we finally got outside she would buck and bounce, jumping into the thick of it. I used the longer leash, usually reserved for parks and beach walks, extending a fifteen-foot roving radius of restrained freedom for galloping through yards. Like a kid off on a snow day I would bundle up and head out for the best, to turn her loose in the backyard to run, roll, dive and play. 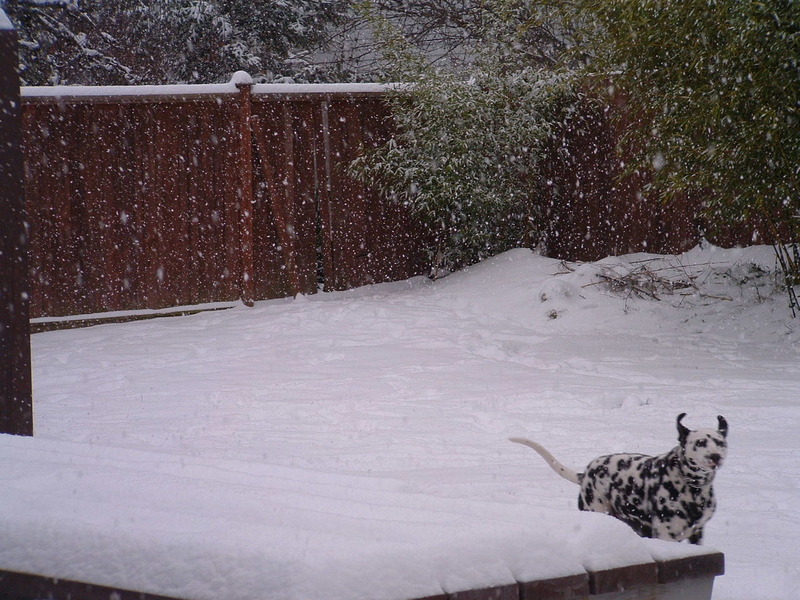 She would gallop through the thick bright white fluff and occasionally stuff her nose into it, snorting with excitement. It seemed that the huge fluffy flakes were her favorite kind, when the opportunity to get out into it came falling, we did. Sarrah discovered regardless of the amount of this mysterious cold illuminating white stuff, it only stays here for a few days and then as quickly, it goes… away. This entry was posted in Sharing Gifts with Sarrah and tagged Dalmatian, Discovery, Dogs, Footprints, Gifts, Home, Landscaping, Memoir, Memories, Moments, Pacific Northwest, Pals, Pictures, Seasons, Snow, Walking, Washington, Weather, Winter. Bookmark the permalink. Ours doesn’t go away until April!! I love watching my dog in the snow….even the word snow makes her excited! !